If you want to know what the Bible says about topics like computers or nutrition or psychology, you may not find them in regular concordances. Where to Find It in the Bible helps you locate specific Bible references to thousands of different subjects! This is a contemporary concordance that uses common phrases to help you locate biblical sources on a myriad of subjects, both traditional and offbeat.Useful to Bible readers, students, Sunday school teachers, youth directors, counselors, pastors, or anyone who wants to find - using everyday speech - relevant Bible passages quickly and easily. An A-to-Z listing of topics puts key Scriptures at your fingertips, without heavy theological language. Includes humorous illustrations throughout. 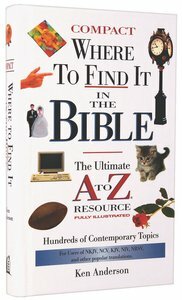 About "Where to Find It in the Bible"